China's most exciting coastal city Qingdao's New District of the core area of the sea, a beautiful and shocking landmark building is about to rise. Elegant architectural form, complex spatial structure and innovative structural system will soon become another epoch-making landmark in Chinese architectural circles. Phoenix is to Qingdao, like a seagull to the sea. The most beautiful moment for birds is when they fly high, with their feathers stretching up and down, and the sun shining against the sea breeze. Such a seaside building, the texture of the space should not only from inside out, but also from outside to inside, natural. Because the main space is a large scale multi-functional space, the arch structure system is adopted. 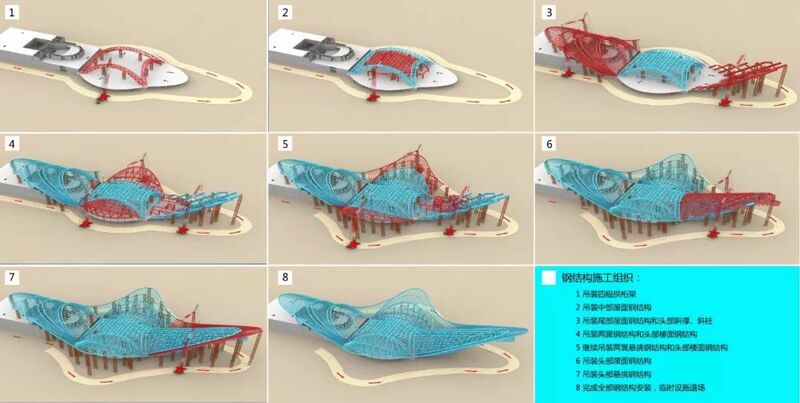 Based on this system, the beautiful shape of the Phoenix wing is derived, which is realized by making a continuous and gradual arrangement of steel skeleton system. The construction area of the project is 31313 square meters, of which there are 8 floors on the ground and 66 meters in height. On the north side, there are 4 storey building spaces in the direction of Jinshatan. At the same time, 5 viewing platforms are set up at the top. The southern side uses three layers of grille members to form the "Phoenix Tail" shape which is connected with the mountain. Visitors can walk up the ramp to the roof activity platform, and then reach the top view platform through the ladder. The first floor is the equipment room and service room with a height of 6 meters. Phoenix's head and neck, which combines catering services and private club functions, provides bungee jumping platforms 52 meters above the ground, opens a comprehensive catering and entertainment hall in its abdomen, a comprehensive Plaza on its back for tourists to visit, and an international first-class opera house with a capacity of 1,200 at its tail. We are trying to challenge the existing boundaries of bionic architecture and rebirth the Phoenix with engineering technology in the new era.